Strangely enough, it’s a sentiment that inverts when modern-day work environments are involved; it turns out that dysfunctional workplaces are so alike that consultants make enormous sums measuring them against standard “winning to woeful” markers. Some might think the majority of vortex workers are those whose positions involve high levels of danger, literal life-or-death decision-making, or lots of time with the vulnerable or suffering. Surprise! Frustrated, confused, fearful, and stressed workers can be found in all types of organizations. Truly senior leadership doesn’t exist, because all the high-level players come and go quickly—as do their initiatives. Set your boundaries, be they wide or narrow. If variety energizes you, spend more time dressing for work and thinking up combinations that bring you delight and liven up the visual landscape. If less is more, though, there’s no shame in a low-key, grab-and-go “uniform” that works for your environment. 5. Whether drawn from real-life touchstones or escapist fantasies, incorporate items that have positive associations. You may not be able to run free with 50 yards of silk like the powerful and dynamic Cyd Charisse, but hey: why not choose a scarf with movement, something worn on a day filled with happiness, or socks/underthings/clothing in your favorite athlete’s colors? It’s an easy way to keep in touch with the qualities you like in yourself or admire in others. 4. Soothe your senses by minimizing color combinations and maximizing the Pajama Alternative Factor. 3. 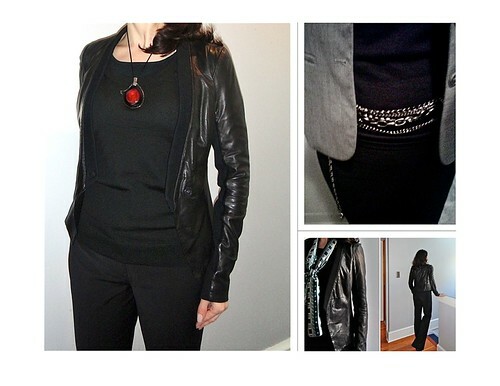 Send subliminal signals by dressing for offense/defense. The opposite of number 4 above, for days when you know it makes sense to show you’re as serious as a heart attack. There’s a reason for the clichés about power suits, ties, and colors. However despondent the game makes you, gird your loins and protect your hide. 2. No matter how low morale and how casual your workplace and/or your Fridays, beware of looking too relaxed, ratty, or whimsical. Do you really want to be wearing a sweater dress with missed patches of cat hair, a Hello Kitty sweatshirt, or wrinkled clothes when the CEO drops by to announce more strategic “reworking”—especially in case it’s you being cut? 1. 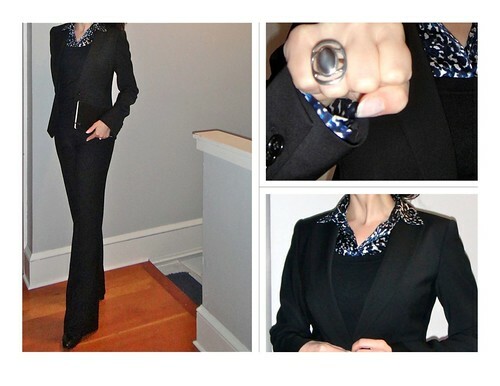 Stock your closet with whatever passes for interview wear in your region and industry. Naturally your CV, accomplishments, and references are updated and ready to go…. What a wonderful unique perspective you have! Love all the ideas!! Thank you! My tongue was semi-planted in cheek but one can only take so many serious stress-reduction articles, right? Thanks for the mention! Yes, you’ve definitely covered the bases here. 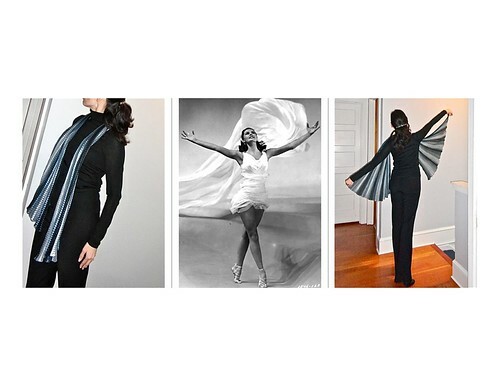 And the Cyd Charisse-inspired scarf is fabulous. I agree about not being too whimsical on Casual Fridays (or any other day for that matter). You’re welcome for the mention. 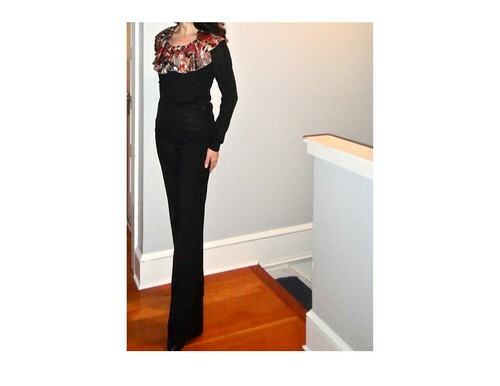 We stretch/movement lovers have to stick together, and you bring such a sophistication to your looks. I love whimsy in the workplace, actually, but it can strike a jarring note when serious news is flying fast and furious. You know how I love my plausible deniability, so let’s just say that I was playing Brenda Starr, intrepid reporter here and that if I *were* in a vortex workplace, your thoughts would be much appreciated. Great post! I particularly enjoyed you idea of power dressing! I’m so happy being a student at the moment. Lots of work places here are in the vortex category! Thank you! I’m glad you’re sheltered a bit by being in school, even though your program sounds demanding. Although late to the party, I’m glad I didn’t miss this post entirely. What a great topic ~ and as I walked away from a vortex job last year, I can totally relate. I was nodding my head at so much of what you said here, but loved all the outfits too. 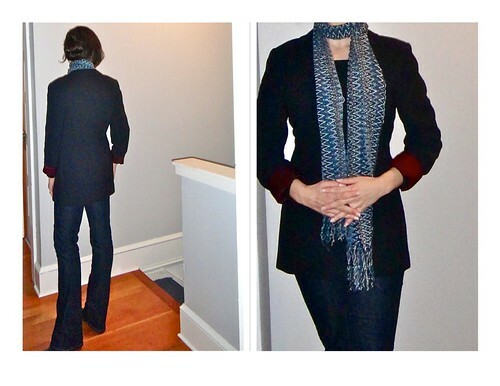 Love the idea of comfort dressing, especially your pants/sweater/velvet scarf combination. And of course, the suggestion to have interview clothes ready is something many of us overlook when we’re caught up in vortex misery. I’ve taken the liberty of nominating you for the Liebster Award. Your blog was the first I started to follow, and I’ve loved every post you’ve written, and enjoyed all your fantastic photos! You can read about it on my blog, and it’s completely up to you if you want to take part or not – but I hope you will, because you’re such a gifted writer as well! I know you got my emailed response so I’ll just say a quick “Thank you so much!” here. I’m excited to say I have some big, positive changes going on right now that are limiting my online time but stay tuned!